I have no idea if this is true, but I recently heard a well-known financial advisor say on television that she believed America would be facing bread lines in coming years due to the state of our economy. Correct me if I’m wrong, but the last time Americans waited in bread lines was in the late 1920s and early 30s. I refuse to worry about this, because there’s nothing I can do except try to live carefully and generously. My life is in God’s hands, and if part of His plan for me is to someday wait in bread lines, I will. I think it’s appropriate to give thanks for food while we have it in abundance. We have so much variety and so many delicious things to choose from, and we can easily take for granted what many in our world only dream about. Have you tried a Honeycrisp apple lately? I paid $1.00 each for them at the grocery store yesterday and didn’t care — they’re wonderful eating. What about fresh, raw pecans? I try to eat some every day. I’m thankful for sharp cheese and tomatoes that are deep red, not pale pink and anemic looking inside. I’m grateful for shredded purple cabbage and warm, fresh-baked bread. I like balsamic vinegar and capers and hazelnuts and pineapple! 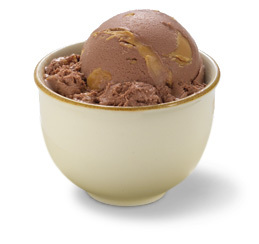 And what about Haagen-Dazs Chocolate Peanut Butter Ice Cream? You’re missing out if you haven’t scouted that out in the frozen aisle — in our city it sells out fast at every store we frequent, and Michael and I grin stupidly at each other when we go shopping and actually find a pint of it left on the shelf. See the ribbons of peanut butter winding their way through the chocolate? But even the tastiest food can sometimes be nothing special to look at, as in today’s recipe. My Swiss Muesli is cold, gray and lumpy, but mmmmm is it good. Apparently Muesli was invented by a Swiss physician for his patients around 1900. I wonder what medicinal qualities he thought Muesli had? There are dry varieties available in cereal boxes these days, but this recipe I’m sharing here is closer to the original, gloppy mixture – it’s made with milk and yogurt and needs to be stored in the refrigerator. I don’t think I’ll take a picture of the Muesli in our fridge right now, because it looks, well, cold, gray and lumpy. It would never hold a candle to the ice cream photo above. But Swiss Muesli is delicious! And nutritious. And it’s filling (my mom would have said, “this sticks to your ribs!”) And if you use good yogurt, it’s probiotic and so good for digestion. I stir these three wet ingredients together in a large Tupperware container that has a lid — this is what I store it in. I often make a double recipe of this, and after it sits in the lidded container in the fridge for a few hours, the oats soak up all the flavors and it looks like a bland, uninteresting porridge. Sounds blechy, I know, but it’s pretty yummy. Michael and I eat this for breakfast at least three times a week, and we both like a little dollop of peanut butter stirred into our bowls with it. They say you can’t judge a book by its cover, and I say Swiss Muesli shouldn’t be judged by its moist, gray lumps, either. Thanks for the Muesli reminder…I got this recipe from you a while back, but have not yet made it….think I’ll give it a try this weekend. Sounds really good…..I will definitely be trying this. When Larry read your post saying watch for this recipe coming up….he had a fit. He thought muesli was a fish. Aah, now I understand why you mailed me yesterday!! Your recipe is for what the Swiss call Bircher-Muesli (invented by Prof. Bircher!) – it tastes wonderful and it’s very good for you!! Your muesli sounds lovely, but perhaps I’d better stick to my porridge mix – I know the calories in that and I’m trying to be good. OK, I am a muslie eater, & I do actually make this when I am feeling domestic ~ which is not often ~ but true to form I own a version of this that negates every positive atribute in one fell swoop! Replace your milk, honey & yoghurt with sweetened condensed milk! To die for! Now that I have ruined your morning…. I’ve never tried making this Swiss Muesli, but it’s on my list of things to do this week. The folks that adhere to the Traditional way of eating would give this recipe a thumbs up, especially if a person uses Crispy Pecans instead of raw pecans. The Swiss were quite astute when they chose to soak the oats in yogurt. According to Sally Fallon (author of Nourishing Traditions Cookbook) all grains should be soaked overnight in an acid medium (yogurt, lemon juice, buttermilk or whey). This soaking process breaks down the phytic acid (an anti-nutrient) and dramatically increases our ability to absorb the nutrients in the grain. Who knew, huh? I guess the Swiss did!